Despite the atrocious recent weather, that has caused some trainers to have their gallops washed away more than once, Linda has been able to continue to work her horses on her all weather surface adjoining the yard. Some of them can be seen here cantering for the owners after Saturday breakfast. 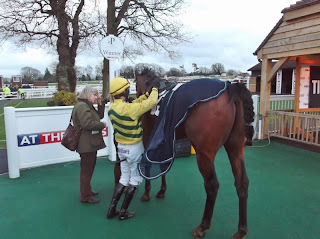 Rowe Park came agonisingly close to recording career victory number twelve, at Southwell today (23/1/2014). Ridden by Liam Keniry he jumped out well enough but took a position in the centre just back from the leaders. Liam pulled him round runners to make a challenge on the stands side entering the final furlong. He was closing on the leader as the line approached and in a bob of heads a photo was called. Unfortunately it showed that Rowe Park had been beaten by a nose. There is little doubt that if the race had been a metre further he would have won. A great effort nevertheless. Patience was rewarded today at Plumpton when Clonusker won a race for the first time. He has been with Linda for 4 years but has been slow to strengthen up, only showing his first real form recently when finishing second in December in a similar Plumpton race. He made the running in that race and he was ridden prominently again today, though not actually setting the pace in the extremely heavy ground. Gerard Tumelty was pleased to find him still galloping happily after the third last flight of hurdles and when no horse came to challenge on the bottom bend he decided to kick on. He went to his left at the second last and wandered about a bit approaching the last, but by then he could be called the winner barring a fall as all the others were finding it hard to make inroads through the mud up the final hill. This was a great result for Linda and the team and for the members of Valence Racing. Earlier in the afternoon members of Valence Racing Too had been pleased when Itoldyou came 4th in the country's most valuable race of the day, and collected £513 for them.